Teach your little one good habits with this handy Good Habits Job Chart from eeBoo. Nine simple chores are displayed on the board, and after completing them, your little one can turn the knob for a word of praise. A ribbon at the top can be hooked onto a wall or door, making it a good reminder to get those chores done! 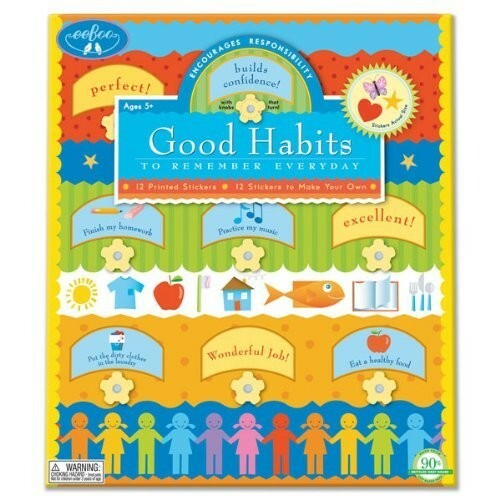 Made of thick, laminated board with bright, colorful illustrations. Comes with 12 job chore stickers, and 12 blank stickers so you can create chores of you own choosing. eeBoo is passionate about producing beautiful, useful and well-made products for children. Using only the original art of well-known and well-loved children`s book illustrators, they create vibrantly original toys and gifts that children will love and remember for years to come.